After her successful campaigns to break bar on entry of women in some Hindu temples, Bhumata Brigade chief Trupti Desai on Thursday took her movement for gender equality to the famous Haji Ali dargah in Mumbai but stopped short of going into the shrine, avoiding a showdown with the protesters who had gathered to block her. 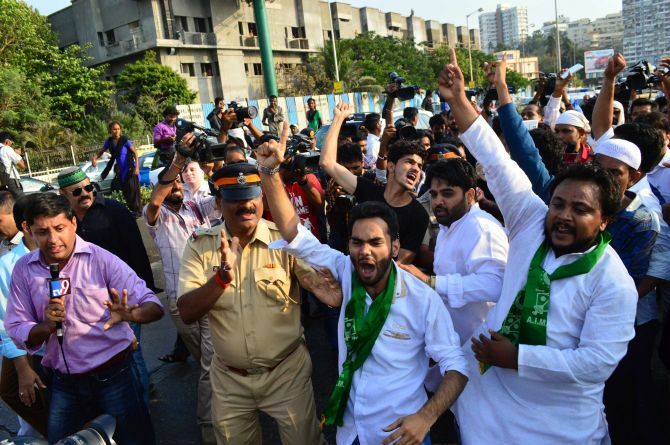 Desai, who reached near the entry of the causeway leading to the dargah situated on an islet off Worli coast in south Mumbai with fellow activists, left the spot after a few minutes as the protesters gathered around them to thwart their attempt. 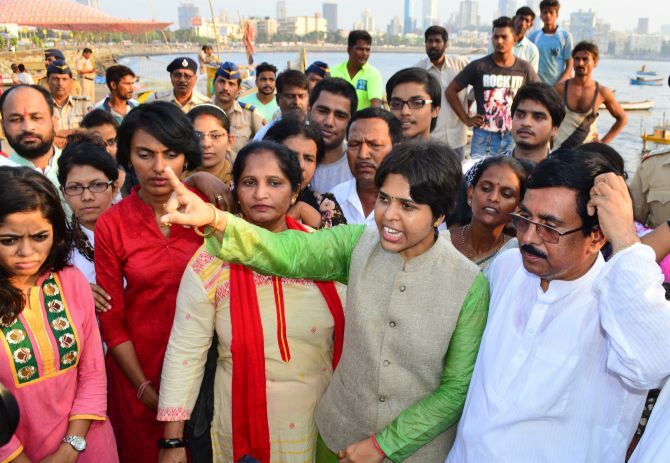 IMAGE: Bhumata Brigade chief Trupti Desai addresses a mediapersons at Haji Ali dargah. Photograph: Sahil Salvi. Before heading to the spot, she told media that she was leading a "peaceful agitation" to assert women's right to go up to the core area (Mazaar) of the dargah. She, however, made it clear that she had no intention to hurt religious sentiments of anyone but was only trying to make sure that women are given equal rights to pray in all places of worship. She said that she had also written to Bollywood celebrities like Shah Rukh Khan, Salman Khan and Aamir Khan seeking their support for the gender equality movement. Expecting a face-off between the campaigners and the protesters, including those from the All India Majlis-e-Ittehadul Muslimeen and the Samajwadi Party, police had barricaded the entire area. Some supporters of the campaign also turned up there pledging support for the agitation. Desai had recently successfully led campaigns to break bar on women at the sanctum sanctorum of Shani Shingnapur and Trimbakeshwar temples in Maharashtra. 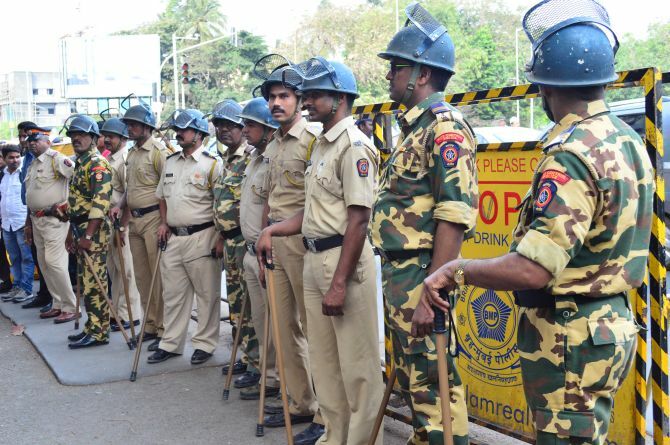 IMAGE: Police tighten up the security near Haji Ali dargah. Photograph: Sahil Salvi. Earlier, a local AIMIM leader had threatened that he and his supporters would not allow Desai to enter the sanctum sanctorum of the renowned dargah and they would smear her face with black ink if she does so. A local Shiv Sena leader Haji Arafat Shaikh accused Desai of playing politics. Meanwhile, state Revenue Minister Eknath Khadse of the Bharatiya Janata Party told PTI that the government will respect the high court verdict that women should not be discriminated against at places of worship. Asked why she is staging protest when the matter is sub-judice, she said "its not a question of being in a hurry. The matter is pending in the court since 2012. If women can be allowed to enter other places of worship, the same should be done in Haji Ali too." Desai, whose previous campaigns were centred around Hindu temples, said her agitation for right to equality for women at places of worship in not linked to any religion. "It's not about any religion. I am doing this for gender equality. Rules should the same for both men and women." IMAGE: Protesters shout slogans against Bhumata Brigade chief Trupti Desai. Photograph: Sahil Salvi. Referring to protests at Haji Ali against her campaign, the Bhumata Brigade chief asked "What is the Home Minister doing? He should ensure my safety and facilitate my entry into the shrine." In a related development, a civil petition was filed in a Mumbai Court seeking a ban on the entry of Desai into the inner chamber of the iconic shrine dedicated to a 15th century saint. The petition, filed by activist Hemant Patil, also contended that she cannot stage a protest in the area around the dargah as it falls in a silence zone. Counsel for the petitioner Wajid Khan argued that Desai should be governed by Muslim laws which do not allow women to enter the sanctum sanctorum of a shrine. The court posted the matter for arguments on June 15.